"...the day we face each other, she will be sorry; sorry for rendering me emotionally impotent. And that will be my victory." Their blazing courtship was nearing marriage, before fate played its vicious card. Rimi dumped Gabriel and married the choice of her family but Gabriel decided to remain single. Why did Rimi take such a drastic decision? How did Gabriel keep up his single hood? Did they meet again or did fate succeed in keeping them apart? How does Sneha fit into the picture? Crafted with the characteristic flavors of Bengal, THE LAST SURGE brings you the tale of an ace football player turned relationship counselor and what made this protagonist a great brother, a greater father and an even greater romantic. Now a days Indian Writers are busy in describing tales about love only but still there are some books that do indulges in the same genre but are still refreshing when comes to the way it is being narrated and sometimes unusual twists with the plot provides the cherry on the cake. 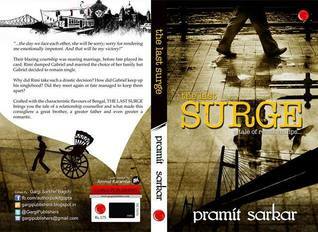 The last Surge being the debutant work of Pramit Sarkar successfully makes a place in the hearts of his readers. The best part of the book is the freshness that comes as the intelligent writing style of the author. It's unique and interesting as well. The story of Gabriel Hopkins and Rimi Chakraborty is pretty touching and does leaves a long impact on reader's heart. Some love stories are meant to stay and seep in your memory for long time. Some stories are immortal and their love story is one of them. The Last Surge is emotionally overloaded and may leave you with wet eyes in the end, so be prepared. I thoroughly enjoyed reading the book and would like to rate it 4/5 .